Let's go ahead and get this out of the way at the top: yes, it all sounds the same. Are you happy? Now that we've dispensed with that nonsense, let's talk about Black Ice, the first new album from AC/DC in 8 years. It's unspeakably funny to read critics trash an AC/DC record – without a hint of irony – for being more of the same. They've been writing the same review of every AC/DC record for a quarter century and the band is the problem? 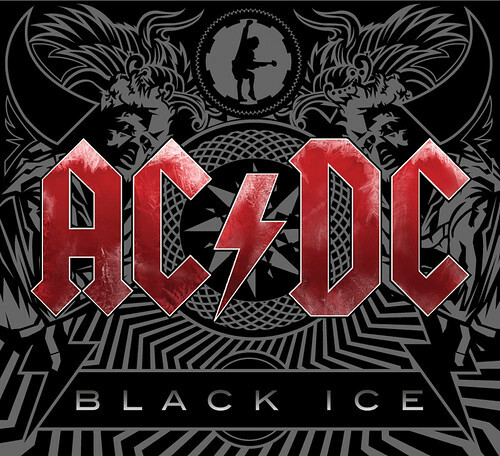 Of course Black Ice sounds like an AC/DC record. It's supposed to! Do you really want them to change? Do you really want them to evolve? Come on! How many of you are out there thinking, “You know, what would be really great is if AC/DC went Mariachi.” If you are, hit yourself or play in traffic. Black Ice is an album aimed squarely at the band's fans. They've never evolved, but the flipside is they've never pandered- unless you consider their exclusivity deal with Walmart a pander. I don't like the deal, but it clearly hasn't changed the band or their approach. 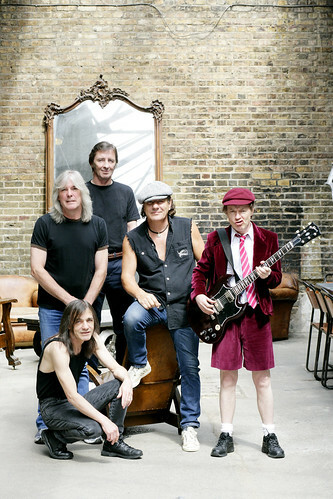 Brian Johnson's shriek doesn't have quite the same piercing quality as it did when he first signed on, having morphed into a smoother rasp but the Young brothers, Malcolm and Angus, are still bludgeoning listeners with their mastery of the riff and that has always been the most important ingredient in an AC/DC song. Cliff Williams continues to anonymously hold down the low end on bass, and Phil Rudd's defiantly minimalist powerhouse drumming is still an inspiration and rock and roll institution. Say what you but AC/DC does care about the album as an art form. They're one of a handful of high profile acts who refuse to give into iTunes and the digital revolution. Their reason? They refuse to allow their albums to be sold as individual tracks, believing in the integrity of the whole. I love that. If that's your line in the sand, though, you've got make that real when you deliver a new album. It's not a law that 15 songs is too many on a single album, but years of observation have taught me it most often is. Sometimes less is more. There's nothing terrible on Black Ice and there are a handful of really strong tracks that bolster a classic catalog of songs. What makes some of these songs filler isn't the songs themselves – although no one would miss another song about rock and roll – but rather the number of them. They just aren't all that memorable and after being pounded into submission by 15 of them it's easy to forget where you started. Well, that's not entirely true. "Rock N Roll Train" is a great rocker and will stick with you. After that it's anyone's guess. Many of the best songs are on the first half of the record. “Skies On Fire” opens with a vintage Rudd count off and then Malcolm Young throws down a tangy riff with a little Southern rock snarl. “Anything Goes” is the type of anthem Sammy Hagar might have written for Van Halen. “Smash 'N' Grab” simmers like “Hell's Bells” without the Grim Reaper imagery. The second half loses a little bit of steam but just as you're about to give up on hearing anything else worthwhile, Angus busts out his slide and invigorates “Stormy May Day,” a song that would otherwise have gone unnoticed. The album ends on a high note with the title track, a rockin' boogie with more funk than anything these guys have tried in years. To some, AC/DC was never a valid band. Others have refused to like anything post Back In Black. If you're in either of those camps, Black Ice has nothing for you. If you're not, you have to be pretty far up yourself to not find something to like. AC/DC may not have evolved much – if at all – over the years but that's okay because there isn't anyone else out there doing what these guys do. If you want AC/DC music, there's only one place to get it. They've still got blood if you want it, and c'mon, we all still want it.